There's just one more day before the lucky winner is determined! 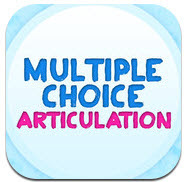 Erik X. Raj's Multiple Choice Articulation app is one of only a few apps that give opportunities for numerous repetitions of the target phonemes in structured sentences and spontaneous speech. Click here to go to my previous post and use the Rafflecopter to enter the giveaway.